Here we will discuss how to create webpart page in SharePoint 2013. 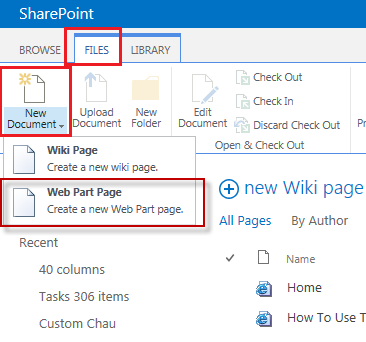 In SharePoint 2013 it is very much simple to create webpart pages. It is different to create webpart page in SharePoint 2013. Then that will open the New Web Part Page, there you can give the name, you can choose the Layout template as well as the Save Location. Then click on Create. From the Site, from the Ribbon on the Page tab click on "View All Pages". Then Click on the Files tab, then New Document and then select "Web Part Page".